Hi, lovelies, I have a fabulous giveaway for you! Have you heard of Dressale? It is one of my new favorite places to shop! They have the best selection of beautiful on-trend dresses, shoes, jewelry and more! You will be amazed entering into their website. 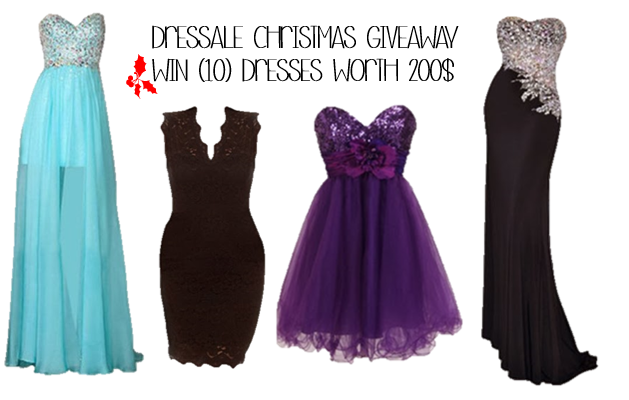 Christmas is coming and now they are giving away 10 dresses every week to their huge fans. Dressale is an online fashion clothing store providing a wide range of high quality customer-made wedding dresses, wedding party dresses, special occasion dresses, shoes and other women clothing. You can find all kinds of the dresses you need. The price is very reasonable for every dress, and we have flash sale, discount everyday. For more details you can come to their website. Giveaway will expire on January 15 and there will be one winner for each dress.